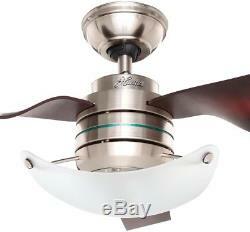 Modern Ceiling Fan With Light Brushed Nickel Indoor 52 Remote Control 3 Blade. This sleek Modern Ceiling Fan With Light will add a touch of sophistication with its three coffee beach finish blades, brushed-nickel finish and frosted light (bulbs included). The wobble free canopy promotes precision balance while the installer's choice allows for 3-position mounting options for standard, flush or angled mounting of the fan. With a high-performance motor for powerful, yet quiet operation and 52 in. 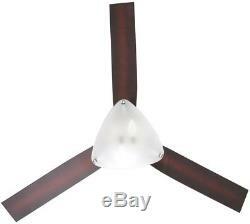 Blades, this fan is ideal for most interior rooms up to 20 ft. Modern Ceiling Fan With Light. 3 coffee beach finish blades. Includes a 2-light fixture with frosted contemporary style glass. 3 speed reversible WhisperWind motor. Installers choice mounting system allows for standard, angled and low ceiling mounting. Must be installed with light kit. Two 60-Watt candelabra based incandescent bulbs included. : 52 in Assembled Height in. : 14.30 in Assembled Width in. : 52 in Ceiling Fan Width in. : 52 Fan Blade Length In. : 21.5 Fan Blade Width In. 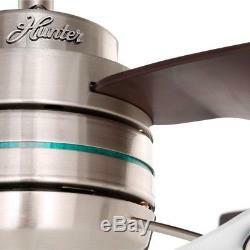 : 21.25 lb Pull Chain: No Remote Control: Yes Returnable: 30-Day Reverse Airflow: Yes Reversible Two-Sided Blades: No Timer: No Certifications and Listings: ETL Listed. Or converter to make it compatible with your nation's 240v-250v standard. Terms of sale and feedback. Feedback is extremely important to us. The item "Modern Ceiling Fan With Light Brushed Nickel Indoor 52 Remote Control 3 Blade" is in sale since Tuesday, October 17, 2017. This item is in the category "Home & Garden\Lamps, Lighting & Ceiling Fans\Ceiling Fans". The seller is "treehouse_deals" and is located in Smyrna, Georgia. This item can be shipped to United States, Canada, United Kingdom, Denmark, Romania, Slovakia, Bulgaria, Czech republic, Finland, Hungary, Latvia, Lithuania, Malta, Estonia, Australia, Greece, Portugal, Cyprus, Slovenia, Japan, Sweden, South Korea, Taiwan, South africa, Thailand, Belgium, France, Hong Kong, Ireland, Netherlands, Poland, Spain, Italy, Germany, Austria, Israel, Mexico, New Zealand, Philippines, Singapore, Switzerland, Norway, Saudi arabia, United arab emirates, Qatar, Kuwait, Bahrain, Croatia, Malaysia, Brazil, Chile, Colombia, Costa rica, Panama.